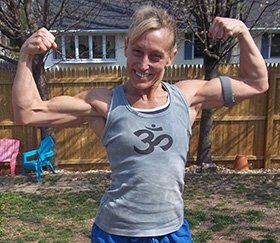 Body Transformation: Fortified At 45! Anna didn't want to be the middle-aged, overweight mom who embarrassed her children in public. See why that will never be a problem! There's something about turning 40 years old. I just had my second child and didn't want to be a mom with kids embarrassed of her. I felt young inside and wanted to look and feel that way physically, too. I've always been active and healthy, so I didn't make any drastic changes. I just had to up the intensity and consistency. But simply "losing weight" wasn't enough. I wanted to look fit and muscular. I wanted it to be obvious to complete strangers that I was a bodybuilder. When I decided to bring my best package to the table, joining the transformation challenge on Bodybuilding.com was key. Since the transformation, I received my personal training and nutrition certifications. It's exciting to earn a living by sharing with others what I learned along the way. You can't ask for more than that. Tracking food was the most challenging yet important aspect to reach my goals. I was shocked to learn how much extra I consumed by a "bite of this' and a "sip of that." I was less inclined to finish leftovers on my kids' plates if I had to tally and log them. I ran into rough spots, but motivation from seeing progress kept me going. I suffered an injury from an accident in 2002 that made some of the exercises hard. I got frustrated when I couldn't move the amount of weight I wanted to, but I did what I could. If I recorded everything, I saw positive changes and stayed consistent. Within three months, I saw definite changes, and within a year I looked like a completely different person. One of the most important choices was to become active on the forums. The friends I made on the site made the harder times easier and more fun. Looking at the incredible transformations on BodySpace was inspiring too. I continuously challenged myself. If I met and completed a goal, I set a new one. I joined online challenges and was delighted to win many and beat competitors half my age! I quickly learned that nutrition was the key to my success. I read whatever I could and kept detailed records of my intake and results so I could tweak and adjust as needed. This allowed me to fit in an occasional treat and keep the cream in my morning coffee. Getting my nutrition in check was the biggest challenge because I love to eat and rebelled strongly against tracking and logging. When I finally buckled down and did it accurately, I was amazed at the way my progress sped up. I could eat nearly anything within reason if I recorded it and it fit with the plan. Completing the 12-week transformation challenge showed that I have what it takes to get lean. A competition is in my future. Being able to wear a bikini into my 50s and beyond is awesome. Do your research. The information is out there. Starting out informed will save trial and error time. Log every morsel. I realize that people have success without logging, but tracking virtually guarantees success, so why roll the dice? Do more at every training session. More weight, more reps, more sets, more something. Set goals and create challenges with yourself and others. Join competitions. Take before and progress photos. I didn't do this and wish I would have. These are the best tool for assessing progress. No one has to look at them but you, although I promise you will show them off to everyone when you reach your goals. Be flexible and have a Plan B. If you were planning to do squats and someone is in the only rack, do hack squats. If a situation pops up and you can't make it to the gym, use a pull-up bar, resistance bands, and bodyweight exercises. Have a support system. It's great if you can get friends, family, and coworkers on board with your new lifestyle, but don't be surprised if they resist. Reach out to the community on the forums. Many are extremely experienced and you will make many friends. Don't let age be an excuse for inactivity. Weight training is the fountain of youth! I originally found the site while searching for protein powders online. The supplement store is amazing with the best customer service. Finding the discussion forums were the major factor in my transformation. I entered (and won) several pull-up competitions that were advertised in the miscellaneous section. Those challenges made it fun. Deciding to compete in the Dymatize 2013 100k Transformation Challenge was exactly what I needed to take my physique to the next level. I had several friends from the site who made the commitment to finish the challenge and the support and accountability made it exciting. I'm so grateful for Bodybuilding.com.